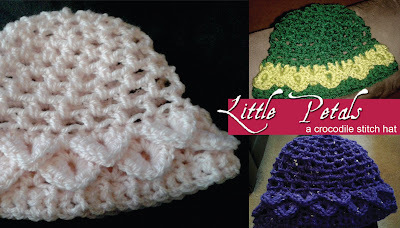 Lolly's Crafty Crochet: Little Petals - a crocodile stitch crochet hat for babies! Little Petals - a crocodile stitch crochet hat for babies! Introducing Little Petals, a crocodile stitch crochet baby hat in three sizes, 0-3 months, 6 month and 12 months. The hat works up very quickly and because of the open mesh crocheting will fit baby for several months as he or she grows! It is a light weight hat, more suitable for spring and autumn (and probably summer if you live in a climate like ours in the UK!) There is also a photo tutorial for the crocodile stitch at the end of the pattern for anyone unfamiliar with it. Update: After being tested by two Ravelry users, tI am very pleased to announce that the pattern is now available to purchase on Ravelry!